A panel on MSNBC’s “Deadline: White House” engaged in a bizarre bit of logic on Wednesday while covering the funeral of former President George H. W. Bush in Washington, D.C., declaring in the same segment that the posthumous praise of Bush was an implicit rebuke of President Donald Trump, that Trump probably took it as criticism because of his narcissism, and that it was wrong for Trump to think everything was about him—before saying that the funeral was not about Trump. Aside from eulogizing the 41st president, who died on Friday, much of the cable news chatter on Wednesday centered on Trump’s presence at the funeral in spite of his icy history with the Bushes; Trump blasted Jeb Bush on the campaign trail as “low energy” when they competed for the 2016 Republican presidential nomination and also criticized George W. Bush for the Iraq War as he took on the anti-establishment mantle. In addition, much hay was made of Trump’s interactions, or lack thereof, with the former U.S. presidents and first ladies seated in his aisle, including his foe in the 2016 general election, Hillary Clinton. Trump, however, received praise in some corners for his warm words throughout the week for the Bush family, enjoying a low bar given his usually abrasive personality and how he reacted to the death of former rival Sen. John McCain. New York Times reporter Peter Baker kicked things off on MSNBC by sounding a familiar note in coverage of Bush’s funeral: that it was a throwback to a more familial time in Washington, unlike the modern-day version of bareknuckle politics dominated by Trump. Baker read Trump’s body language as not always liking what he heard during the eulogies given, but he praised the president for not speaking out loud in the middle of a funeral. There was less of an overt sense of rebuke to Mr. Trump than at the funeral for Senator John McCain in September, where he was not invited, but the implicit contrasts between the former and current presidents were hard to miss. While speakers talked about Mr. Bush’s civility, his commitment to the institutions of government and his faith in alliances, Mr. Trump was sitting just feet away, his arms sometimes crossed, almost as if in defiance. Without directly saying so, the speakers pushed back against Mr. Trump’s mockery of the former president’s volunteerism slogan “a thousand points of light” during campaign rallies this year. Baker surmised that historian Jon Meacham’s invocation of the “thousand points of light” and former Canadian Prime Minister Brian Mulroney’s praise of NATO and NAFTA, which Trump has criticized, during the funeral were digs at the current White House. “If someone had given a eulogy like that five years ago and praised NATO, we probably would have been nodding off, because what else would Mulroney do but praise NATO,” Beschloss said. “Now it’s a headline,” Wallace declared. “And the premise of being invited was that, at least for maybe two hours, you’d stop all this and it’s not about you and just take it in,” Beschloss added. Yet the figure who Robinson declared irrelevant was the subject of much of the MSNBC show’s A-block. 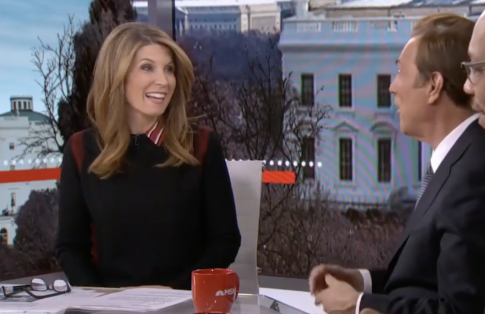 The post MSNBC Panel: Trump Probably Thought Bush Funeral Was All About Him Even Though It Wasn’t, but It Was a Rebuke of Him appeared first on Washington Free Beacon.